(SALT LAKE CITY) A prominent Harvard chemical biologist who pioneered the use of zebrafish to discover new precision drug therapies for cardiovascular and nervous system disorders has been tapped to serve as dean of the University of Utah College of Pharmacy. Randall T. Peterson, Ph.D., will assume his role as dean and L.S. Skaggs Presidential Endowed Chair for Pharmacy effective Jan. 1, 2017. ­­A Salt Lake City native, he earned his undergraduate degree in molecular biology from Brigham Young University and his Ph.D. in biochemistry from Harvard University. 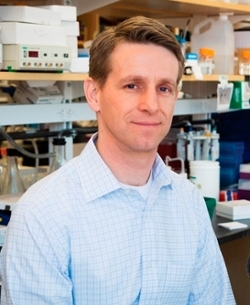 He is the current Charles Addison and Elizabeth Ann Sanders Associate Professor of Basic Science at Harvard Medical School, scientific director of the Massachusetts General Hospital Cardiovascular Research Center and a senior associate member of the Broad Institute. Peterson and his colleagues were the first to use an animal model, the zebrafish, to model human diseases and then rapidly identify small molecule drug candidates for cardiovascular and nervous system disorders. Several compounds discovered by his lab are used as research tools or are preclinical drug candidates. Peterson is a principal investigator or co-investigator on numerous National Institutes of Health (NIH) research grants, including a current $12 million award from the National Institute of Neurological Disorders and Stroke to establish a Center of Excellence to develop novel pharmaceutical countermeasures for cyanide exposure. He was the principal investigator on a prestigious National Institute of Mental Health EUREKA grant to develop psychotropic drugs using zebrafish models. EUREKA grants encourage exceptionally innovative research to accelerate scientific progress. An inventor on numerous patents, Dr. Peterson has served as a scientific advisor to companies including Montigen Pharmaceuticals Inc. and Tolero Pharmaceuticals, Inc. He is also involved in national conversations about the future of precision medicine, a key part of the University of Utah Health Sciences strategy to improve health care. Peterson recently co-chaired the second annual international Zebrafish for Personalized/Precision Medicine Conference. The College of Pharmacy’s outstanding research and academic programs and the world-class reputation of the University of Utah Health Sciences as a whole made Utah an attractive place for Peterson to expand his research and academic career. Peterson’s expertise is well suited to lead the College of Pharmacy, which ranks fifth in the nation for NIH research funding.